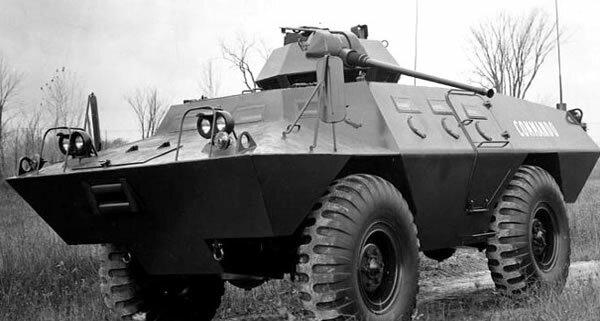 The Commando APC was developed in the 1960’s as a private venture by the former US Firm Cadillac Gage, who later merged with Textron Marine in 1994 to form the Firm Textron Marine & Land Systems who now manufacturer the vehicle. The first prototype was completed in 1963, with production commencing in 1964. The first production vehicles were known as the LAV-100 Commando. 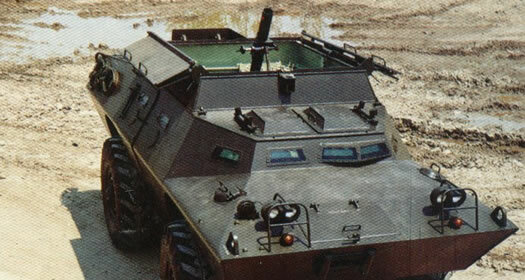 The Commando should not be confused as a member of the GDLS Canada’s 6×6 & 8×8 LAV series. The vehicle was shortly purchased by the US Forces and deployed during the Vietnam War. It was developed in to a family of vehicles to fulfil many roles and upgraded into newer variants. Original model. Used a petrol Chrysler V8 engine coupled to a 5-speed manual gearbox giving the vehicle a top road speed of 100 km/h and top water speed 4.8 km/h. The vehicle is constructed from high hardness alloy steel, which provides all-round protection against 7.62mm Machine Gun fire. The vehicle hull has angled sides, which helps deflect the blast from mines, but is not an MRAP. The vehicle was an enlarged version of the V-100 and utilized many components of the US Army’s 5 ton trucks. This version was specially tailor-made to the specifications of the Singapore Armed Forces (SAF) and manufactured exclusively for use by the SAF. This vehicle was an improved model, which had a V-504 V8 turbocharged diesel engine, generating 202 bhp with a Power/weight ratio of 18.75 bhp/ton and an operational range of 643 km’s. It has a top road speed of 88km/h and top speed of 5 km/h in water. Production swapped from the LAV-100 to the LAV-150 in 1971. In 1985 production swapped again to the LAV-150S which has a longer wheelbase and is heavier.